At the end of her dream year, a flying, fairy-tale finish – the kind Sarah Healy has produced with such class and consistency throughout 2018. The 17-year-old Dubliner may not run to win awards or amass accolades – medals are the currency she truly craves – but from gun to tape her accomplishments in 2018 made her an outstanding choice for the Irish Independent Young Sportstar of the Year. 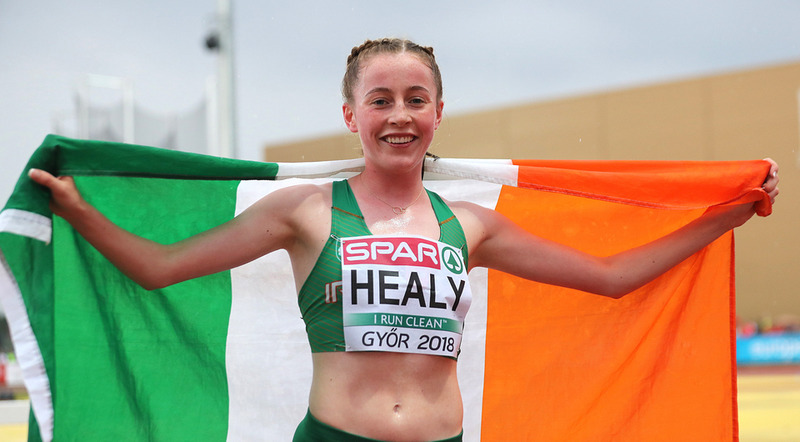 To get a handle on her class, consider this: the 4:09.25 Healy ran for 1500m in July was the second fastest ever by a European U-18, the fastest in 32 years. Traverse the world in an event with genuine global reach, and you’ll find just one U-18 athlete – Kenya’s Edinah Jebitok – who has come within five seconds of her this year, and even she is two seconds in arrears. The signs were there in February – a young star set to go supernova. Having just turned 17, Healy cruised away from Rio Olympian Kerry O’Flaherty to win the Irish senior indoor 3000m title in 9:10.43, carving 18 seconds off the Irish U-20 indoor record. But fast times are just one tool in her artillery. In July, she went to the European U-18 Championships in Hungary and blasted away from her peers to win two gold medals in the 1500m and 3000m with astonishing ease. What’s more, there’s little to suggest she’s a young star who’ll simply burn out or fade away. Under the careful guidance of coach Eoghan Marnell, Healy still combines athletics with hockey at Holy Child Killiney. As for her attitude, the way she picked herself up after falling mid-race at the recent European Cross-Country and fought to a top-10 finish against older athletes just about said it all. An iron will, coupled with class, courage and down-to-earth modesty – she could go very far.